Cork is enjoying special attention as this year's European City of Culture and this was reflected at this year's International Choral Festival, long established as one of the world's most important choral competitions. The concerts and competitive sessions attracted large audiences to the City Hall, its imposing exterior cleaned for this auspicious year, the whole city being spruced up. Building works and cranes are everywhere. The red coach parked on the quayside brought the Tiade Choir (3rd prizewinners) all the way from Latvia, exemplifying the festival's focus on the European Union new accession nations. Following the opening event, Berlioz's grandiose Te Deum with 400 on stage, a smaller scale presentation of Ethnic Voices focused upon ethnic diversity within the enlarged European Union, with representatives of far flung cultures presented in traditional costume. Most surprising for the Cork audience were Sardinia's Tenores di Bitti, who combine medieval polyphony with North African influence (enjoyed last year in Marktoberdorf) and the well-travelled throat singers of Mongolia, Huun Huur Tu, whose show, now familiar on the World Music circuit, we had encountered on the Edinburgh Fringe festival. The Eva Quartet, spawned from Les Voix Bulgares, charmed (despite our having to take on trust what they were singing about) with the particular vocal inflections they brought to arrangements of national favourites. Ireland was represented by an international trio of singers based in Switzerland in euphonius arrangements by Kathleen Dineen of texts by Yeats, O'Casey and traditional tunes, and (most individual and unusual for us) by unaccompanied solo singer Iarla O Lionaird who keeps alive an age-old song tradition of Cuil Aodha in County Cork, his melismatic decorations to the vocal line having something in common with those of the Bulgarians. The National Chamber Choir (conductor Celso Antunes) cemented the fine impression they left last year with a selection of festival commissions, giving another fine programme of newish music which exemplified the immense diversity of idioms employed by distinguished European composers during the second half of the 20th Century. It was received warmly by a gratifyingly large audience and proved to be nearly a great concert, marred only by the choice of Henze's lengthy Orpheus Behind the Wire to end a long evening, with a late night concert to follow. Henze's setting of poems by Edward Bond is text-driven; the words regrettably could not be printed in the programme (most other texts and translations were provided) and were completely indecipherable by ear, even though ostensibly in English. Before this we had been dazzled and moved by a reminder of the innovatory textures and density of Ligeti's Lux Aeterna, music popularised in the film 2001: A Space Odyssey, and Per Nørgard's Wie Ein Kind , in which Rilke is juxtaposed with bizarre outpourings of the schizophrenic poet Wölfli, requiring dazzling choral virtuosity. Penderecki was represented by Veni Creator, an example of his retreat from modernism, Vasks by Litene , an immensely powerful response to a notorious massacre of Latvian soldiers by the Soviets, and Rautavaara by a breathless and pessimistic Suite de Lorca. Harmonious Coleridge & Yeats settings from a cycle by the senior Irish composer, James Wilson, left a positive feeling, and the Netherlands composer Rudolf Escher's Emily Dickinson cycle Songs of Love & Eternity (1955) was a discovery for all of us. Its quiet contemplative epigrammatic conclusion, about one clover and one bee sufficing to make a prairie, would have ideally ended this overlong concert, so the more because we had to go straight on to help fill Cork's other cathedral for another choral event. Anuna's choreographed presentations are distinguished by a sophisticated amplification system, incorporating 'delay', which persuades you that the sound comes to you not from the multiple loud speakers, but from the voices of the personable young singers themselves. Michael and John McGlynn had 'redefined traditional Irish music' in arrangements presented mostly in solo melodic lines with chordal accompaniments, a method which can become somewhat monotonous; listen for yourself. Their late night concert in North Cathedral was warmly received, as they are everywhere, but changes of personell, tired jokes and a certain complacency made Anuna's show less sharp and impressive than when first experienced years ago in the Chapel of the (then) Royal Naval College at Greenwich, and certainly not to be compared with the eager freshness of Philomela's choreographed concert given last year in Cork's North Cathedral. Judith and Holofernes is a simple (simplistic ?) chamber opera which appeared to have been modelled on the Church Parables of Benjamin Britten, a new genre of music theatre for which he found a strikingly new musical language in the '60s, the first (Curlew River) an adaptation of a Japanese Noh play. John Gibson draws his score from a series of undisguised references to composers from Rimsky-Korsakov to Satie, taking in many other allusions on the way, but without forging them into a voice of his own. 2. In addition to showcasing outstanding international choirs, Cork International Choral Festival has continually championed the composition and performance of new music. In former years U.C.C. hosted a seminar on contemporary choral music in conjunction with the Festival and recently the National Chamber Choir has presented most exciting programmes of contemporary music. The Festival, which continues to encourage the performance of new music by Irish composers, in conjunction with Cork 2005, presented John Gibson's chamber opera "Judith and Holofernes" at St. Finn Barre's Cathedral. The opera (libretto, based on an Old Testament story, by Robert Craig) tells the story of how Judith, a young Jewish widow, commandingly sung by Julia Canavan saves Jerusalem by seducing and killing Assyrian general, Holofernes (Martin Higgins). Uzziah (Sonya Keogh) is the vacillating Jewish leader and Achior (Gerry Noonan, whose clarity of diction and commanding presence was most impressive) is the Canaanite leader who warns the Jews of Holofernes' plans. It is a simple story, simply told and convincingly presented by Cork Opera Works (Conductor, John O'Brien). For Cork's visitors from abroad, the Fleischmann International Trophy Competition is the heart of the Festival. Strong performances by choirs from Latvia (Tiade) and Finland (Madetoja Music High School Choir & The Musica Choir) seemed to head the contention from our point of view. Medical students from the Philippines brought far Eastern colour and Choros Amici, an interesting English group which assembles its members from all parts of the country for rehearsal weekends, made a good showing. They brought the house down with Mäntyjärvi's Pseudo Yoik, a setting of nonsense words which epitomises my oft-repeated concern that the international ideal of this festival should, despite cost and labour considerations, embrace as imperatives the making of all the multi-national texts available in translation for audiences and adjudicators. And, against expectation and our feeling that the participating countries from farther north should sweep the board, it was England who prevailed and won the day (Choros Amici having previously embarrassed a festival in Peterborough by coming first in every category). The medical students from the Phillipines, great favourites with the audiences, won the Peace Trophy for the choir that gives the most enjoyable performance of the Festival. Full details of all the competition results are available to study on the Cork Choral Festival website. 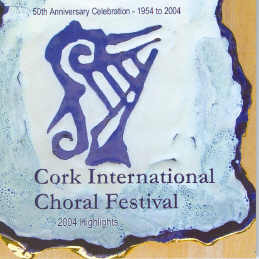 See also Musical Pointers report on Cork 2004 for fuller background to this Festival and its 50 years history.